I live and have always lived in what is classified the "deep south." This term may mean a lot of things to a lot of people but what it has always meant to me is I get cold at 70 degrees! When I became executive director of CASE and began traveling more extensively, it also came to mean I need lots of sunshine and I had no idea other parts of our country didn't have flowers year around! We even have what we call "winter" flowers. There is not a time of the year in my neighborhood when we don't have something blooming! In January and February it would most likely be pansies and camellias! 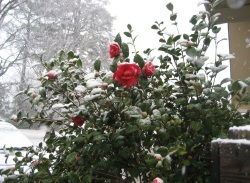 The picture above is of my camellia bush one February when we actually had snow. We get snow about once every two to three years. I know many people don't believe in global warming but honestly we did used to get snow every winter. Now when I say snow, remember that is from a Deep South perspective. The ground does turn white for about 6 hours until the sun gets going good and then it all melts away unless it is a blizzard and then we get about 3 inches and it takes a good 24 hours for it to melt away. We need that hard freeze here to kill the mosquitos that will carry off small dogs in the spring if we don't have a "harsh" winter! Having said all of that, the air is crisp around here and so we can tell it is fall. Well, that and the fact that everyone is now playing/watching football, too! My definition of crisp morning air is probably different from yours — remember I am cold at 70 but we are back to wearing sweaters to work over our sleeveless blouses since it will be almost 90 in the afternoon! Probably we have a greater temperature differential than most places! I live in what is called Middle GA (actually as an aside, the new Miss America is from Warner Robins — her parents are both Physical Therapists and their clinic is in walking distance of the CASE office) and our temperatures do get below freezing but never stay there very long. But as an example, the temperature this morning was 61 but by the time I get home this afternoon it will be 85. To many of you, 85 is summer time! Why did I go off on this tangent? We are all different. We are different in part because of where we grew up and where we live. We are familiar with different things. We are comfortable with different food, clothing and entertainment. But we have so much in common and we have so much to learn from each other! Sometimes though it is difficult for us to orchestrate opportunities to "cross pollenate!" If we are always only around people who are just like us, how will we ever learn? As educators, we know we have to expose our students and their families to new experiences if they are to learn and grow. We know this important fact but we often ignore it in our own life! CASE leadership believes strongly in collaboration — that is one way to expose our members to other ideas and different associations. Later this week, IF you are a member of CASE, you will be receiving the CASE quarterly newsletter in your email box (or you can go to the MEMBERS ONLY section of the CASE website and download it from there. This issue of InCASE will have the first article in a new Lucky 21 series on Medicaid in Schools. These articles are written by fellow collaborators from the National Alliance for Medicaid in Education, Inc (NAME). After we have published the 21 points in our newsletters over the next year, these articles will become Lucky 21 #8. Be sure to read this new series! Speaking of Lucky 21... Again, IF you are a member of CASE, you should also be receiving, based on your U.S. mail service, your free copy of the newest Lucky 21 — #7: What Principals Need to Know About Special Education in the next week or so. If you are not a member of CASE, you can purchase your copy of this new Lucky 21 or the other six titles by going to the CASE Products section of the CASE website. These monographs are a great way to get vital information into the hands of teachers, administrators, parents, Board members, etc. Remember earlier when I said how we can learn from each other? One of the best ways to do that is to attend national/international conferences. If you come to the CASE Conference in Atlanta in October, you will be with people from almost every state in the U.S. and several other countries! Just think about all the amazing networking you can do with these folks. Registration for the 26th Annual CASE fall conference is definitely a bargain at member price of only $400 considering the price includes all the handouts, lunches on Thursday and Friday, full breakfasts on Friday and Saturday, and Break on Thursday and Friday, and great free resources from vendors, CASE and networking with your colleagues! We have over 40 breakout sessions, the schedule is still tentative. Be sure to register soon, and to get your hotel room at the Atlanta Hyatt Regency be sure to use the access code: case! Or go to the CASE home page! Last week, the Poll asked, What are the most important mental health issues you have noticed in your district? At first place with 50 percent of those responding to the poll was student concerns at the high school level. There was a tie for second place at 20 percent each, student concerns at the elementary level and individual staff mental health. Student concerns at the middle school rounded off the responses at 10 percent. I hope you took the time to read up on Sequestration! It is looking very likely that the government will shut down come Oct. 1 and that will not be good for anyone! Be sure you continue to talk to your legislators! Nurture your new teachers through every stage of their professional growth. These two forthcoming publications from CEC will help you ensure your new teachers are ready for the classroom — and prepared for the future. Pre-order them by Sept. 21 with the code SURVIVETHRIVE and save 15 percent! Create positive classroom environments, and more! Buy this how-to handbook for every teacher on your staff—it's spiral-bound for easy sharing! CEC wrote the book on special education ... literally. Our Red Book outlines the knowledge and skill sets that every special educator really needs to know to best support students and fellow educators in your inclusive classrooms. It includes easy-to-read tools for understanding standards, performing self-evaluations, and aligning standards with individual state standards, and includes guidance on creating professional development plans that will help your team build their paths toward future career goals. Almost everything in this edition has been updated, including the Ethical Principles and Professional Practice Standards, the Preparation Standards and the Specialty Sets. Get your new teachers off to a great start in the classroom AND help them stay there. Buy the New Special Education Teacher Toolkit, containing both The Survival Guide for First-Year Special Education Teachers and What Every Special Educator Must Know for the low price of $40.95 — that's over 15 percent in savings! Plus, use the code SURVIVETHRIVE by Sept. 21 and save 15 percent more! 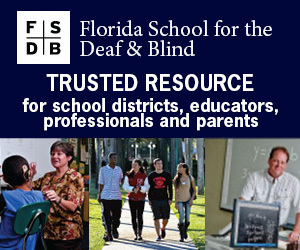 Get the New Special Education Teacher Toolkit now! Visit any school and it is likely that you will see children who have academic difficulty misbehave and children who have significant behavioral issues fall further and further behind academically. It is doubtful that one can truly separate academic and behavioral outcomes at any level, but as a child's issues become more intense, the likelihood of concurrent academic and behavior problems rises. Join the National Center on Intensive Intervention Sept. 23 from 2:00-3:30 p.m. EST for a free webinar, Bringing it Together: Why it is Important to Integrate Academics and Behavior When Thinking About Intensive Intervention. In this webinar, Dr. Erica Lembke an NCII Trainer and Associate Professor in the Department of Special Education at the University of Missouri, Nicole Bucka an NCII Coach and MTSS Technical Assistance Provider in Rhode Island, and Dr. Gail Chan NCII's Technical Assistance Coordinator will discuss the integrated relationship between academics and behavior, review a case study example using DBI to provide individualized integrated academic and behavioral support based on student need, and share behavioral strategies intended to support teachers working with students with primary academic deficits and challenging behaviors.